The LSD symposium two years ago, commemorating Albert Hofmann‘s 100th birthday, was, it seems, successful enough to generate some healthy momentum. Catching a relatively quiet, but extremely significant wave of resurgence in scientific psychedelic research, this forum capitalized well on the attention garnered by the father of LSD’s centenary, bringing people from around the world to discuss psychedelics of all descriptions in the location of the notorious first ever acid trip. Over 1500 people filled the Congress Centre in the peacefully stimulating city of Basel over Easter weekend. With official endorsements from Swiss International Air Lines and Basel Kantonalbank, this sort of event is a slight culture shock for the British or Americans. We may not have embraced psychedelics in the way the enthusiasts of the early ’60s might have envisioned, but their hopes are alive and well. At the forefront of said wave of research are MAPS and The Beckley Foundation. I caught MAPS‘ Rick Doblin on the first afternoon, introducing Swiss psychotherapists who have been conducting trials investigating the therapeutic potentials of MDMA and LSD. MDMA is now being studied in several places for its beneficial role in treating Post-Traumatic Stress Disorder. Its famed ability to enable contemplation of deeply negative memories without their imprinted, paralyzing associations, makes it a good candidate for success in this field. Peter Oehen (of the Swiss Association for Psycholytic Therapy) made some interesting observations on his experience with MDMA therapy, such as the arc of experience he has repeatedly seen in sessions: first, relaxation; then, the appearance of physical symptoms; then, as these somatic knots are worked with and through, the welling up of conceptual and emotional insights. Evidently MDMA resonates strongly with the work of people like Wilhelm Reich, in which trauma is seen to be bound up in the body. There are very good cases to be made for psychedelic therapy in any number of situations. But, as Grof notes, the idea that itâ€™s still difficult to license it for terminal patients who are deemed beyond medical help, is both ridiculous and revealing. It shows clearly that our culture’s problem with the issue has little to do with the idea that psychedelics might mess peopleâ€™s lives up in some way, and much more to do with an unwillingness to do what [Grof and Pahnke’s subjects] want to do: face death consciously. The fact that this sort of research is proceeding again—along with all the other sanctioned psychedelic experiments now underway—is exciting, heartening news. Indeed, being so soaked in the broad, speculative end of psychedelic culture myself, I found these presentations much more thrilling and inspiring than many of the rallying cries for psychedelics to “save the world”. Not to dismiss such rhetoric entirely; it’s just a different, more tangible buzz for me to hear of individuals in genuine need having distress alleviated. This is the agenda of MAPS in action; more power to them. The Beckley Foundation, headed by longtime advocate of consciousness research Amanda Fielding, was present at the forum as the proud sponsors of the first study in over thirty years of LSD use in humans. Our understanding of the brain has surged forwards since the last legitimate scientific LSD research took place, and this study hopes to use modern neuroimaging techniques to gain a high-res understanding of the interactions between this still-fascinating substance and human neurochemistry. At the forum, Fielding presented her theory on the link between human consciousness and blood supply to the brain. Essentially, she thinks evolution has left us with an insufficient supply, leaving us susceptible to various mental disorders, and that through the ages healthy societies have been those who have found ways of compensating for this. It’s one of those perspectives that can persuade the open mind to an extent, but its very simplicity makes one wary of reductionism. Certainly, it’s another option in our increasing range of ways to understand consciousness, and deserves more research. The Saturday saw a splendid line-up of ideas, research, passion and art. Jeremy Narby delivered an erudite and stimulating talk on his ongoing quest to find spaces where science and shamanism can agree to disagree on points where they clash, to leave room for the tantalizing overlaps. Following his experiment of taking Western molecular biologists through ayahuasca sessions in the Amazon to see if they could gain accurate biochemical information from their visions (detailed in the excellent Shamans Through Time), he took on a more passive role in facilitating a cultural-scientific exchange between an American tuberculosis researcher and a Peruvian shaman. The shaman discovered, through his ayahuasca visions, a plant with great success in treating tuberculosis. Exactly where these tentative cross-pollinating missions are heading is uncertain; that they are happening at all, though, is hugely encouraging. Dale Pendell was a great discovery for me. Just that morning I had remarked to a friend how discussion of magic and the occult was lacking from proceedings. Pendell more than made up for this with his trip through the “mythopoetic roots of psychedelic practice in the Western Tradition”. With Milton’s Eve as the first curandera, and Plato’s ambivalent pharmakon as a guiding principle for the “poison path” of plant medicine, Pendell rooted the mythology and philosophy of psychedelics right into west Eurasian soil. Through Faust, he pinpointed the West’s quintessential magical operation as that of conjuration, giving form to spirits. Commercial incorporation, he emphasized, is plainly a most dangerous form of magic, giving legal reality to an abstraction whose prime motive is gain and profit. The spirit is conjured, with no circle of containment; “hungry ghosts” empowered and turned loose on the world. ‘Nuff said. Kathleen Harrison has been known to me for a while as the former wife of Terence McKenna. Her presentation on her long-term fieldwork with indigenous Mazatec people in Mexico neither substituted for, nor paled in comparison with McKenna’s unique presence. Harrison was perhaps the most outspoken and coherent voice for animism (or, as she phrased it, “inter-species drama”). 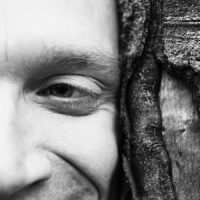 The Mazatecs, famed via MarÃ­a Sabina for their use of psilocybin mushrooms, and as the lone guardians of the odd psychedelic Salvia divinorum, are evidently a treasure trove for ethnobotanists, and it’s fantastic that such a sensitive and dedicated researcher as Harrison is working with them. Harrison’s talk was bursting with tips for pragmatic, conscious engagement with plants, ancestors, the whole realm of spirits. It was very edifying to hear someone so obviously versed in the extremes of visionary information downloads, that while responses to questions asked of ancestors inevitably come with persistence, they are “never quite verbal”. She feels these answers arise at the subtle levels of instinct and spontaneous impulse. A cautionary note against the showy verbiage of many methods of “contacting the dead”, and a reminder that animism is really a perpetual refining process, learning through direct experience how to hear the quieter voices around and within us. She ended with a statement of belief in the value of research into consciousness, religion and healing that was all the more pointed and rousing for her acknowledgement that its worth lies in the ongoing importance of such work in any situation—not just the possibility of it effecting some large-scale world-saving miracle. Kat Harrison reminded us all why we were there. A showing of Jan Kounen’s excellent documentary, The Other World, on ayahuasca use among the Shipibo-Conibo Indian of the Peruvian Amazon, rounded off a thoroughly engrossing day. I sadly missed the bulk of Sunday’s presentations in a haze of tiredness and networking. Monday saw some juicy para-forum extras: seminars and workshops with illustrious folk such as Stan Grof, Ralph Metzner, and Alex & Allyson Grey beckoned. I opted for the coach trip to the HR Giger museum. We got a brief but energetic tour around the current exhibition of visionary art there from Claudia MÃ¼ller-Ebeling, including wine and cheese. (The museum is in GruyÃ¨res, the home of my favourite cheese; eating it right there while viewing psychedelic art was a genuine treat!) Naturally Giger’s own work was wondrous to behold, especially in a setting where every detail is crafted in his style, right down to biomechanical patterns on the paving outside and spinal column handrails on the steps. The short trip ended magnificently with a swift beer in the Giger Bar, just opposite. Arched spines vaulted the roof, skeletal alien chairs supported the locals chatting against the bar, and incongruous smoky jazz drifted around. More than a few comparisons to the Star Wars cantina were bandied around to describe the atmosphere. Do pop in if you pass through Switzerland. In all, a resounding success. We felt the lack of more diverse after-hours social events—these being apparently limited to the customary trance and techno gatherings. But the balance between the tangible encouragements of hard science and more mercurial expressions of the psychedelic world worked well. Most importantly, it was easy to see a proliferation of new connections between individuals sparkling around the place. There’s an important cultural flame to be tended and maintained here, and Basel in 2008 saw it flare up with healthy enthusiasm. 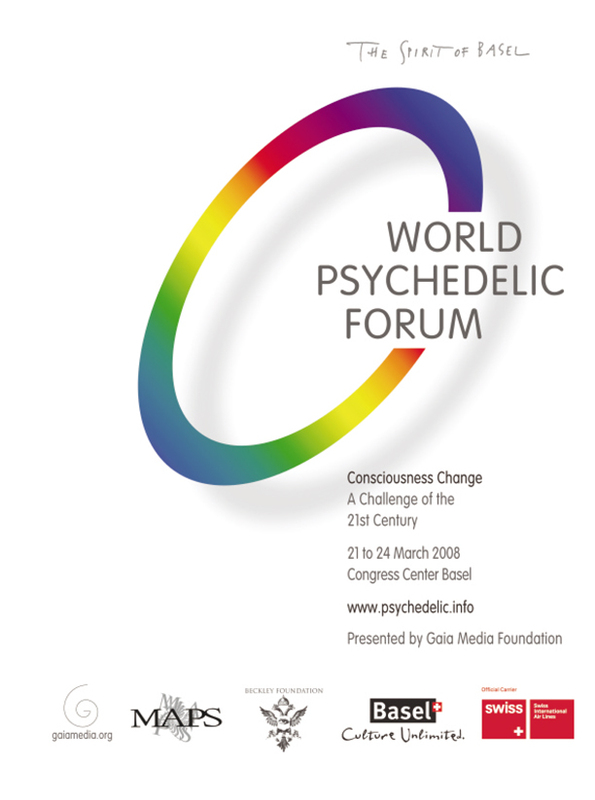 World Psychedelic Forum by Gyrus is licensed under a Creative Commons Attribution-NonCommercial-NoDerivatives 4.0 International License.